Here is a gorgeous vintage demi-parure that is just as wearable today as it was when it was new, over 50 years ago! The metal is gold-tone. The bracelet is a bangle that opens on a hinge. 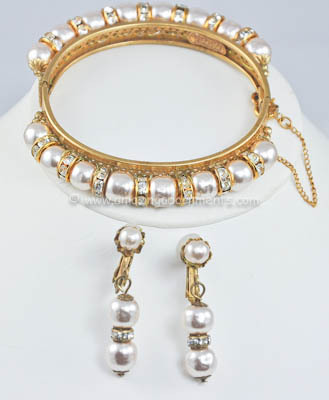 The metal band has luminous baroque, cream in color faux pearls and rhinestone rondells attached. The safety chain is still present and working! The matching drop earrings have the clip/screw comfort finding. All pieces are signed. Condition: Excellent vintage. Very gentle wear to the metal noted from age and prior use. Measurements: Bracelet: Opening: 2 1/4". 3/8" wide. It opens and closes with a hinge so it should fit most wrists. Earrings: 1" drop from finding.